A precious piece of jewellery is something we are likely to treasure and want to wear as long as possible. But over time, we can begin to outgrow jewellery, or the metal may become tarnished. However, with a professional jewellery repair service, we can extend your jewellery’s life and have it looking good as new! When your favourite ring begins to look a little dull and discoloured, professional jewellery cleaning can bring a new lease of life. However, great care needs to be given to tarnished metal to ensure the cleaners used aren’t abrasive. Therefore, jewellery cleaning from a professional will best keep your accessories in safe condition. Remodelling jewellery is perfect for pieces you have outgrown in size or style. While allowing you to keep the original design, you can also add personal touches. For example, other than resizing you may wish to use the gems from a broach to create a ring or stunning pair of earrings. This is particularly favourable for sentimental heirlooms which aren’t quite your style. Before it completely disappears, ask your local jeweller to re-engrave your jewellery. This will allow you to hold onto the details which made you fall in love with it for continued wear. 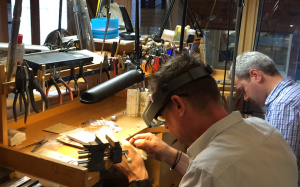 Having old and damaged jewellery professional repaired will help you to recycle your favourite pieces. It is always good to take it in for repair as soon as possible to prevent further damage. If there are any loose pieces, such as gems or links, keep them together incase your jeweller can reattach them. Researching the appropriate care for your jewellery is the best way to extend its life. For safe keeping, store your jewellery neatly in soft lined compartments to avoid scratching or chipping from being knocked together. It will also allow you to organise each piece so nothing gets lost, tangled or dusty. If you wish to clean your jewellery yourself, use non-abrasive solutions. For example, soap and water with a soft toothbrush or a dry soft cloth. Just ensure to avoid any contamination. Finally, always make sure you keep your proof of purchase and warranty for if you ever do require a repair or replacement. Since 1986 Allen has led a team of passionate jewellers to create stunning jewellery collections and commission pieces. With such experience and expertise, you can trust our team at Allen Brown Jewellery for jewellery repairs on old and delicate accessories. To find out more click here or visit us instore at Heart of The Country Shopping Village in Staffordshire.